First time seeing the new chassis in person (I missed the last couple Sonama races). Great proportions and curves. I forgot how loud these cars are, especially the Honda. While the turbos definitely remove some of the harshness, these sound like a proper racecar should. The track was insanely green at first. Very sandy. Times on the green track started out in the 1:16s, eventually dropping into the 1:14s. 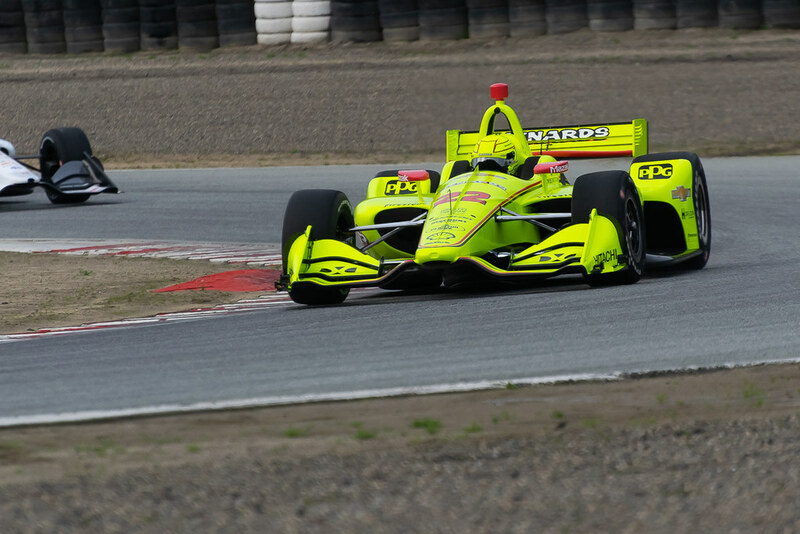 A few guys were on it immediately… Pagenaud, Rossi, Veach, and Chilton in particular. It looked like cars were able to follow pretty well through turns 3-4-5-6. Hopefully that means we’ll see some overtaking come Fall. By the end of the day, times were set in the low 11s (racer.com). Will we approach the 1:07.722 Champ Car lap record with warmer weather, rubbered in track, and Firestone Reds? We’ll see.